When embryos are cultured in the lab, they are housed in incubators where gas and temperature levels are closely monitored to mimic the environment of a woman’s fallopian tube. The moment embryos are exposed to unstable environment, they may suffer from undesirable shock or stress. Thus, the incubator plays as one of the most important piece in every IVF laboratory. Esco Medical benchtop incubators provide a robust solution with its smaller compartment, aiming to provide faster temperature and gas recovery. After opening a chamber, the parameters in the incubator return to its normal condition 5-6 times better than conventional box incubators. Temperature and gas recovery of Miri® Benchtop Incubator versus conventional "big box" incubator. 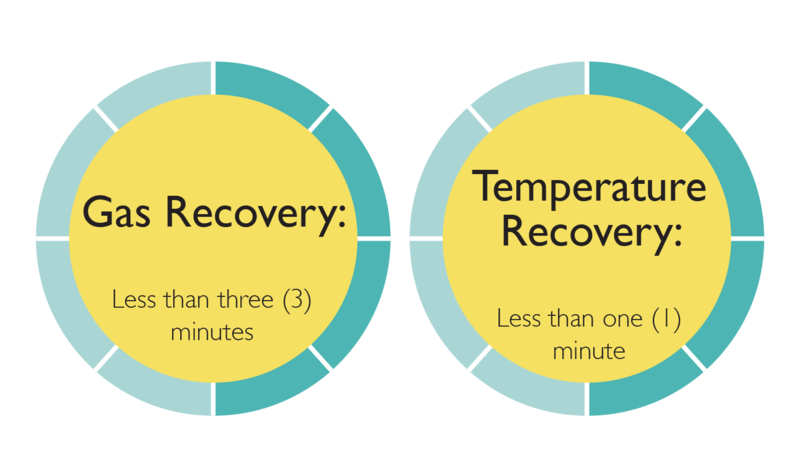 The Miri® Time-Lapse, Miri® and the Mini Miri® benchtop incubators have exhibited excellent recovery rates for both gas and temperature. An independent study conducted shows that the Miri® TL has an overall reliable and stable parameter performance. Click here know more about this study. 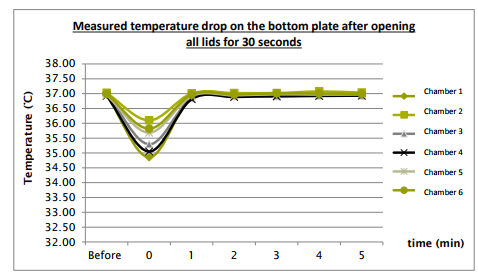 Graph showing temperature recovery of the Miri TL after lids were opened for all six (6) chambers for 30 seconds. Graph showing the CO2 gas concentration after lids for all chambers were opened. Data were recorded every minute for a total period of 5 minutes. Graph showing the O2 gas concentration after lids for all chambers were opened. Data were recorded every minute for a total period of 5 minutes. The Miri® and Mini Miri® have heated lids and bottoms for excellent uniformity and enhanced temperature regulation. Both also have removable heating optimization plates to facilitate direct transfer of heat from the bottom plate to the media. It has also been well documented that the ambient air of IVF laboratories carried harmful Volatile Organic Compounds or VOCs, microbes, scents from perfumes, cleaning chemicals, etc., which affects embryonic development.4Hence, it is essential to have air filtration/ purification system to filter these air contaminants. The Esco benchtop incubators are specially equipped with HEPA+VOC filter to help eliminate harmful VOCs and particulates. Our benchtop incubators are equipped with PT1000 temperature sensors and gas sampling ports for external temperature and gas validation of each chamber. Miri® and Mini Miri® can be connected to an external device such as the Esco Miri® GA for gas and temperature validation. 1Swain, J. (2012). Is there an optimal pH for culture media used in clinical IVF? Hum. Reprod. Update 18, 333-339. 2Sun, X., Eang, W., & Keefe, D. (2004). Overheating is detrimental to meiotic spindles within in vitro matured human oocytes. Zygote 12, 65-70. 3Swain, J. E. (2014). Decisions for the IVF laboratory: comparative analysis of embryo culture incubators. Reproductive Biomedicine Online 28, 535-547. 4Khoudja, R.Y., Xu, Y., & Li, T. (2012). Better IVF outcomes following improvements in laboratory air quality. J Assist Reprod Genet 30:69-76.